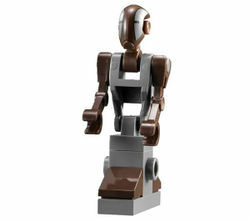 FA-4, also referred to as Dooku's Pilot Droid, is a minifigure based on the droid from the Star Wars universe. One such droid was the personal pilot of Count Dooku's Solar Sailer. The 2009 FA-4 is all white and has arm, leg and body pieces commonly used on Battle Droids, and the piece commonly used as a Skeleton foot for a head. It was released in 7752 Count Dooku's Solar Sailer. The 2013 FA-4 is completely different from the first. The head is the same as the Commando Droids' one, but with grey markings. The body and arms are the same as a battle droids', the former being dark grey and the latter being dark brown. The lower body is made of a dark grey 1x3 plate, two dark brown cheese slopes, a dark grey 1x1 brick with 2 studs and a dark grey 1x1 plate with a vertical clip. It appeared in 75017 Duel on Geonosis and 75023 Star Wars Advent Calendar in August 2013. One such droid piloted Count Dooku's Punworcca 116-class Interstellar Sloop prior to and during the Clone Wars. Later, in 19 BBY, FA-4 and FA-5 models could be seen working side-by-side at the Republic Executive Building after the Battle of Coruscant. This page was last edited on 9 January 2016, at 22:10.